Understanding petroleum production in Michigan can be difficult if you’re new to it. It can also be confusing even after you’ve studied it. My 9 year old son just started the 2014-15 basketball season. The kids just had their first two practices last week and the coach warned the first few practices would be pretty boring. Coach said the first few practices would be dedicated to the fundamentals of dribbling, passing, and shooting exercises. Sometimes kids just want to play games. But, they’re never going to achieve success unless time is set aside at the beginning for learning the fundamentals. My point with that anecdote is the first steps toward understanding petroleum production in Michigan are much the same. The key elements of petroleum production to know first are: history, units of measure, production resource units, and pricing. Respectmyplanet has access to the same production data that everyone else does. What’s different is that we use exclusive software written for communicating this data in a way that’s interactive with our map. We intend in this article to give you a primer course on production basics so in future articles we can share more interesting topics in ways you’ve never seen before. We have many planned publications that examine the fundamentals of whether petroleum production in Michigan is economic for the taxpayers of our state and for the good of the Michigan economy at large. 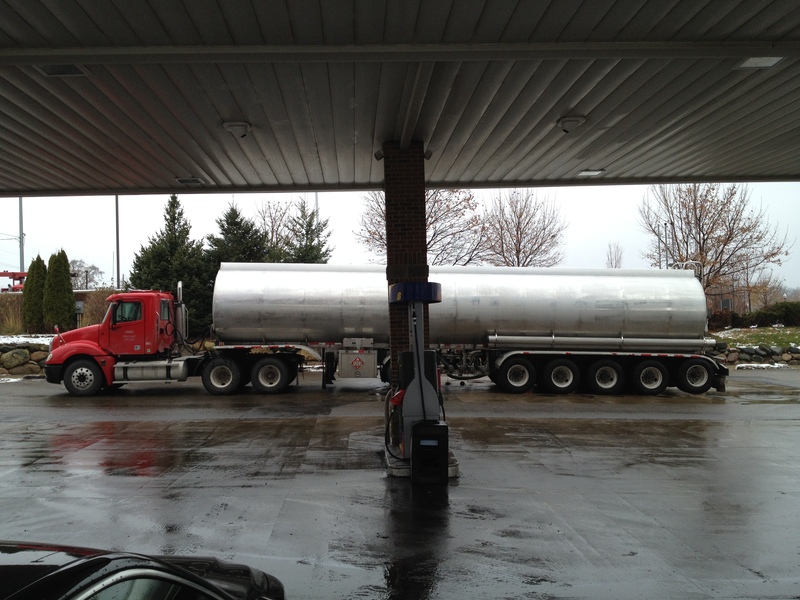 A gasoline tanker just filled at Meadowbrook Rd in Novi empties its 13,400 gallon load at the USA 2 Go fueling station at Milford Rd & I-96 in Lyon Township MI. 13,400 gallons is a standard size tanker truck for crude oil, gasoline, or waste water. The first thing to understand about petroleum production is that it’s done for profit above all else. Saying that petroleum production is about profit above all else is not an affront to our energy needs or the working men and women of the petroleum industry. We respect all working men and women and understand very well their struggles because that’s who we are too. We must understand all for-profit businesses have this goal in mind whether that business be a car wash, a restaurant, a grocery store, Et al. We also must, however, keep a close eye on petroleum production because it involves using public resources to create private profits; this can lead to bad legislation if there’s corruption. Before we look at current data, let’s understand a little bit about Michigan’s oil & gas production history. If you read published papers from renowned geologists in Michigan’s production history like this one about the Dundee or this one about the Niagaran, you’ll see the Dundee has produced approx. 375 mmbo and the Niagaran has produced approx. 490 mmbo. Yet, if I download the production database today and totaled all barrels of oil from all formations, the total is less than 372 mmbo. What can we make of this unreconciled situation about more than twice as much oil produced than the total amount in the database? And, if you don’t know what mmbo means, stay tuned, we’ll get to that in a paragraph or two to demonstrate a point. Bill Harrison is a professor emeritus of geological sciences at Western Michigan University which is my alma mater. I had the same question as you about why production numbers in the database didn’t match technical papers written by respected geologists. If you noticed, both of the papers linked above have a common co-author Bill Harrison. Bill is the one of the most respected senior geologists in the State of Michigan and I emailed him to pose the question of where he came up with those numbers. It was enlightening to get some feedback from him and learn a couple key things about Michigan production history. It made perfect sense to learn from Bill that production from 1926 to 1982 cannot be reliably obtained from the production database. The State Oil & Gas Summaries, the United States EIA, and the MPSC Production Database are the generally accepted sources to aggregate data between 1926 through today’s current date. According to Bill, the data in the Michigan database becomes the most reliable source in the year 1997. If you review the production database you would notice that the first year of data available is 1969 but that somehow the data does not seem to make sense until the year 1982. From 1982 to today, I would have conjectured that the data was reliable based on basic data analysis skills. I did not realize it wasn’t until 1997 the data became reliable and I’m thankful for Bill’s help there. It was something I would have missed if I didn’t ask and we always want to get it right at The Org. When we do detailed aggregate analysis in coming articles at RMP we will use the aforementioned fundamental concepts as our basis for reporting. Even so, it is important to note that all data in Michigan is approximated; even by the most respected geologists in our state. And, even then, data always comes with implicit disclaimers about keypunch errors, failure to report, and timeliness of when data is reported. One of the key parameters to keep in mind when reading RMP articles is that we accept data reported subsequent to 1997 as valid for drawing sound conclusions in aggregate for our state. Another key parameter about well specific reporting at RMP is that specific well data from 1969 to 1982 is accurate on a well-by-well basis but not in aggregate for the state of Michigan. And lastly, RMP reporting considers data from 1982 to 1997 is reliable in aggregate for certain formations and certain operators that were reporting diligently during those years of Michigan’s O&G evolution. Should you decide to want to reference our data sets, we will soon provide instructions on how to cite our exclusive sources in your own bibliographies. This is a list of a few of the more heavily used acronyms related to oil & gas production in Michigan. This article is being written in December of 2014. 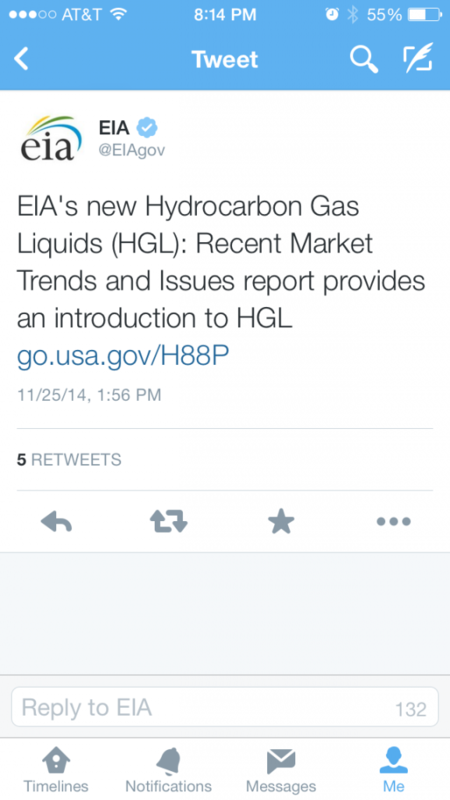 The last term in the table above HGL or Hydrocarbon Gas Liquids is brand new. If you follow the EIA on twitter, they just tweeted that term November 25, 2014 and referenced this new paper of why the term was necessary to adopt. RMP will always be on top of new ways to report about the energy sector of our economy and how it relates to water. We are paying close attention to the acronym HGL as Michigan still reports using the term NGL. Michigan may adopt the term HGL in order to standardize their reporting to that of federal reporting but that will remain to be seen. If Michigan does start using the term HGL, we will let you know about it here as soon as we know. Michigan production cannot be well understood without understanding production resource units. RMP’s 3 basic general characteristics for a PRU are: general, legal, and surface geography definitions. In general terms a production resource unit relates to a subsurface reservoir. In legal terms, a PRU gets very complicated but basically means who personally benefits financially from Michigan’s natural resources. We always look at natural resources from a public perspective in that fresh water is always a publicly owned asset. RMP believes that when fresh water use comes into play all taxpayers should have a reasonable democratic say as to whether they think that use is abusive, uneconomic, or not in the public’s best interest. Lastly, a PRU from the surface generally means one or many surface locations like oil or gas wells, central processing facilities, sweetening facilities, pipelines, Et al. This subject has been somewhat complicated of late with the introduction of Collingwood testing that began for the first time in 2010. Each Collingwood well has been given its own PRU# even for wells on the same pad. By contrast, Summit Petroleum’s St. Helen Unit spreads over acres of land and 117 wells make up one PRU. It is important to pay attention to whether a PRU# has a 1:1 relationship with a well or a 1:many relationship. 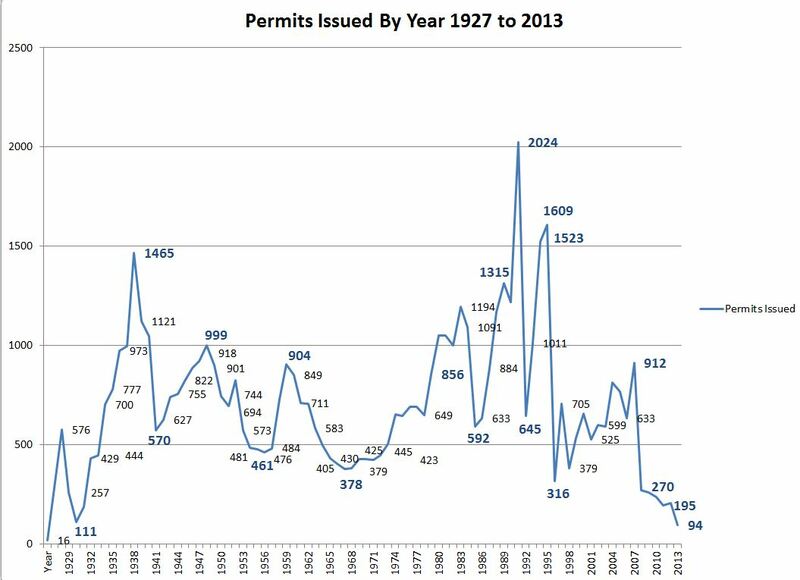 This graph shows the number of permits issued in Michigan for oil & gas related wells from 1927 to 2013. Permits issued do not correspond exactly to wells drilled, completed, or produced but do act as the primary key indicator to oil & gas activity in Michigan. As of December 5, 2014, Michigan has approximately 7,100 different PRU#s in the latest Michigan database available by the MDEQ. The numbering of PRUs is sequential in nature. When wells retire their data remains on the list. The rate of new wells being permitted in Michigan is the lowest it’s ever been in Michigan since 1931 which is the nadir point of Michigan permitting history. While permitting does not translate directly into drilled wells or production, it is a key indicator of oil & gas activity in Michigan. Each of the 7,100 PRUs in the Michigan database have data submitted for oil, condensate, NGLs, mcf of natural gas, and bbls of water. If operators are producing a well that does not produce one of those products, they are still required to enter a zero. Most people don’t realize that every well produces a mixture of fluids and gases that must be separated into each of the aforementioned categories with surface infrastructure. Each operator must process the output of their well bore into saleable products and waste products. The water that comes uphole is toxic waste. Hydrogen sulfide gas is also toxic but can be saleable or waste. CO2 that comes uphole is generally considered waste and is generally vented to the atmosphere. 237 of 7,097 (3.3%) of PRUs report having produced 6.1 million bbls condensate in Michigan’s all time history. 581 of 7,097 (8.2%) of PRUs report having produced 8.8 million bbls NGLs in Michigan’s all time history. 5,048 of 7097 (71.1%) of PRUs report having produced 5.8 trillion cubic feet of natural gas in Michigan’s all time history. 4,509 of 7,097 (63.5%) of PRUs report having produced 1.73 billion bbls of waste water in Michigan’s all time history. By far the largest amount of product by volume is waste water at 1.73 billion barrels. That number in gallons is 1.73B x 42 = 72.7 billion gallons of waste water. 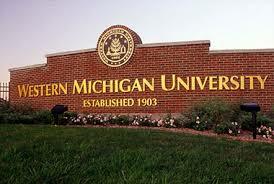 The waste water to oil ratio, the largest two products of Michigan’s subsurface geologic formations, comes to 4.66:1. That means for every barrel of oil produced in Michigan’s MPSC database with all the limitations discussed previously 4.66 barrels of waste water are produced. Most of this waste water is disposed in class 2 injection wells. Some waste water gets spread on Michigan roads as a de-icing agent in the winter or a dust control agent in the summer. The waste water must be permitted by the MDEQ before it can be spread on roads. Trucks that carry heavy waste water loads use public roads paid for by taxpayers. A full sized waste water semi tractor trailer type truck is generally 13,400 gallons (see picture above). Finally, we come to the last piece of the puzzle and the most complex: money. Adam Smith wrote in his magnum opus about economics “war is the most complex and noble of the all the arts”. The Japanese have a saying that “business is war”. With the introduction of money and for-profit business into the mix, motivations can change because of avarice. RMP takes a raw look at anyone who fronts a position inconsistent with data or the economic truth as it can be proved with reliable sources. We do not hesitate to dig for the data that supports or debunks a person’s or entity’s stated position. All of our work is non-partisan and non-profit to maintain an objective stance with regard to the issues we discuss as they relate to money, profits, the net destruction or creation of wealth, the net destruction or creation of jobs, GDP, net importing/exporting, and all things related to the economy. With that additional disclaimer out of the way, we will use average pricing from a given year for the base of our money calculations. We will then used the measuringwealth.com site using the “income measurement” conversion type to make a calculation of what the average oil price of was in a given year relative to the current year. 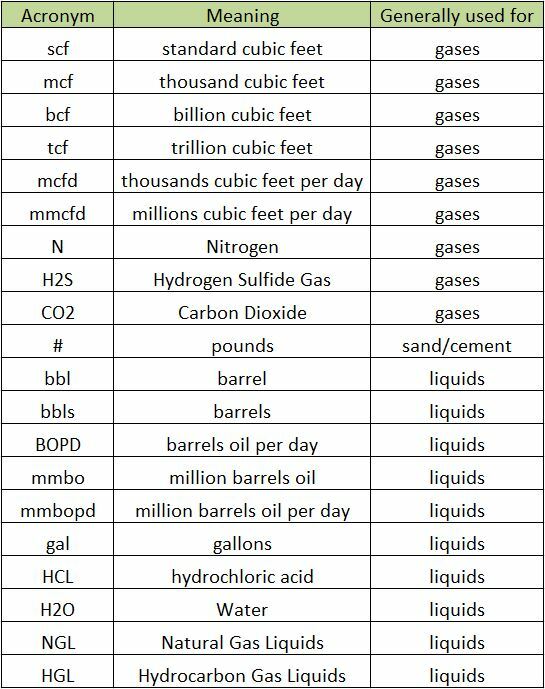 Like all things oil & gas, the numbers will always be approximations based on a standard table of figures. All of our pricing figures and current dollar conversions will be upfront, published on our site, and available for public scrutiny. We welcome all feedback if you have ideas on how the information could be more reflective of the highest economic standards. We will rely on state sources, federal sources, and we will always provide applicable references. Ok. That was a little boring to get through. But, like the analogy in the beginning, it was necessary in order to get to the more interesting information we plan to start publishing. We have big energy challenges facing our state and country. Michigan has all the resources we need to domestically achieve energy independence in our state without oil, natural gas, or any other hydrocarbon with zero greenhouse gas emissions and net 0% consumption of freshwater. And, although that accomplishment might not be achieved for years to come, the turning point has already begun. While the hydrogen in the hydrocarbons we talk about will be key to understanding how we graduate to the post hydrocarbon economy, we must understand where we are and where we come from. Hydrocarbons will be in our lives for the foreseeable future. We can now, however, begin phasing hydrocarbons out of our energy mix and fertilizer production in favor of using water. Some hydrocarbons, like crude oil for instance, are currently obsolete for the first time ever and a more aggressive timeline can be pursued to phase gasoline out of our energy mix. While we will continue to need and rely on the hydrogen in hydrocarbons for years to come, many institutions like the US Dept of Energy and the US Military have started laying the ground work to retire hydrocarbon infrastructure which is good for the environment and economy. Countries like Germany, South Korea, and Japan are also starting to make significant headway in gearing up to retire hydrocarbon infrastructure too. While it’s encouraging that companies like Toyota, Honda, Hyundai, GM, Ford, Mercedes, BMW, Volkswagen and Boeing are finally starting to migrate our transportation sector toward renewable hydrogen production from water, it remains a challenge to ramp up new infrastructure. With all the basics laid down, we can now start to talk about Michigan’s petroleum production, gross values sold, and current production volumes. We will start to demonstrate petroluem production information using our Google Maps API v3 application. We’ve got an App for that… And it’s going to be fun to demonstrate and we look forward to sharing with you the next evolution of the respectmyplanet.org mapplication: Org 2.0. Stay tuned. Interesting stuff. Thanks for compiling it. It’s hard to believe that Michigan’s production is so low (versus 1986, for example), considering the flurry of oil/gas production activity we’ve seen in this state during the past half-dozen years. As for hydrogen, do you really see a viable future for this energy? General Motors has been researching hydrogen-powered automobiles for many years, and while we’ve seen a few vehicles on the road as a result, there’s been nothing done on any grand scale. I feel we’re still a long way off on hydrogen for automobiles. Thanks again for the good info. Well done! Thanks Steve. We’ve actually heard more hype about oil & gas than we’ve seen activity, I think that’s the difference. The rock always dictates petroleum production, not propaganda. The consensus estimate is that fuel cell powertrains will be dominate by the year 2030 as a production platform. Fueling stations are a big challenge. Here is a link to hydrogen fueling stations in operation and in development in California provided by our friends The California Fuel Cell Partnership @ (http://cafcp.org/stationmap). California is ahead of Michigan as they have 9 stations operating currently and 49 more in development and we have 0. Matt and all — thanks for this information. You do a great job of providing clear concise info, that’s so much easier to understand. It’s helpful to know what the O & G production actually is, and to see these documents for ourselves. We’re so lucky to have this resource that you provide, that many people in Michigan have come to depend on. Matt, are there any wells in the upper peninsula? Yes, all of which are dry holes. 15 permits were issued for wells in the Upper Peninsula. 4 of those permits were never drilled. Wells were drilled in the years: 1929, 1937, 1940, 1941, 1945, 1951, 1953, 1972,1980, 1981, 1989, and 2005. There were even 3 wells, all dry holes, drilled into Beaver Island in 1961. I’m glad you asked this question Steve because I wanted to say that in the near future I will be publishing some easy to follow videos that will show you how to do the same search I did. You can find that info as well as do a TON of other cool searches. I was able to find that information out in under 1 minute because of the way our search engine software is programmed to work fast. It’s so easy to do and totally functional right now. I just need to make the instructional videos so it makes it easy for you to use too. You soon won’t be able to believe how easy it is to find anything oil & gas related in Michigan using the respectmyplanet.org map’s multiple well search button. Please stay tuned the website as we are about to start publishing short easy to follow instructional videos on how to use all the POWERFUL search features of our map. Please subscribe to our YouTube channel here. We have a ton of content geared up for publishing in 2015. Thanks for the good info, Matt. Oddly enough, if we must have drilling in our state, instead of drilling near residential neighborhoods as we’re starting to see more and more, a better place would be in the UP, where there are enormous swaths of land–mostly government owned and with few residents around–that would be more appropriate for this kind of activity. Thanks again, Matt, and I look forward to the videos.